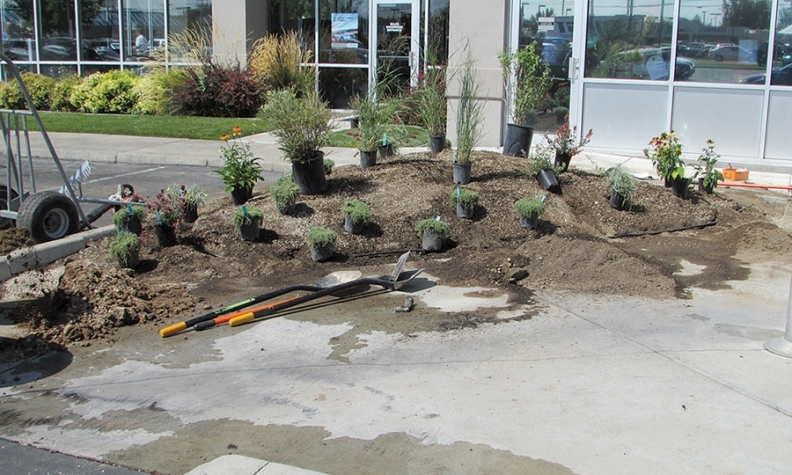 Larry H. Miller Subaru Boise tore out thirsty, non-native plants and replaced them with greenery more eco-friendly to Idaho. It's common for dealerships to be active in local charities. Many dealerships, including a number on this year's list of the Best Dealerships To Work For, pursue green initiatives, from switching to energy-efficient lighting to recycling motor oil to installing solar arrays or wind turbines. Several dealers combine the two: They have found ways to turn their green efforts into greenbacks, thereby donating to local and national charities. For example, in the Sacramento, Calif., area, the Niello dealerships have been turning over hundreds of pieces of used equipment such as computers and printers to YNot Recycle for years. With franchises including Fiat, Mini, Maserati and Porsche and their changing business needs, there has been a steady stream of equipment to recycle or donate to nonprofits. "On average, we recycle approximately 50 to 60 computers per year, between 15 and 20 printers and a couple hundred pounds of miscellaneous equipment," said Summer Wright, Niello Co. director of marketing. Usable electronics have gone to Mustard Seed, a Sacramento school for children without homes, and more recently the Salvation Army. Or consider Carbone Subaru in Troy, N.Y. It uses an electronic storage company that employs disabled veterans to scan and shred documents, relieving the dealership of storage and security problems while contributing to veterans' paychecks. Don Chalmers Ford in Rio Rancho, N.M., saves aluminum trim and scraps from the service department and bags them for resale. Employee Rich Mummey, a parts sales specialist, has spearheaded the aluminum recycling program, which raises money for the Pediatric Brain Tumor Foundation. Mummey learned about the foundation through his Gold Wing motorcycle club. "When I heard about the foundation, I thought maybe we could use money from recycled aluminum and hopefully the dealership would like to add this to other community projects they were already doing," Mummey said. The dealership designated proceeds from scrap aluminum for the foundation in 2007, when it began selling the recycled metal. The Pediatric Brain Tumor Foundation is the only recipient, and the dealership matches all revenues from the sale, Mummey says. The business has embraced this project every year, he says. "Besides matching the funds I raise, they also provide a vehicle during the annual Ride for Kids charitable event," said Mummey, who has inspired several of his colleagues, both in sales and service, to get involved with the fund raising. Motorcycle clubs across the country participate in Ride for Kids, organized by a North Carolina association for motorcycle enthusiasts. The annual rides raise money for the foundation. A year ago, staff members at Larry H. Miller Subaru Boise, in Idaho, leaned on their shovels and uprooted the grasses and shrubs decorating the property. The thirsty, non-native plants were composted, making way for more eco-friendly plantings suggested by the Idaho Botanical Garden. "In Idaho, grass needs about 2 inches of water per week to grow, and in the Boise area, we only get 12 inches of precipitation a year," said Eric Smith, Internet sales manager at the dealership. The idea to hook up with the Idaho Botanical Garden came from dealership employees who had visited the nonprofit during its Winter Garden aGlow display and raved about it at work. "At the store, we felt with Subaru's commitment to the environment and sustainability, this might be a perfect partnership," said Smith. "So we just picked up the phone and gave them a call." Smith ran the thirsty-plants problem by Toby Mancini, horticulture director for the garden. "Toby came to the store and created a design for the space," Smith said. It included plants native to Boise. "He then lined up the professionals that got the job done," said Smith, adding that the grounds now are irrigated through a drip system. That's a low-pressure, low-volume watering system, in contrast to the drenching that the grounds previously needed and got. Both the new plants and a partnership blossomed: The dealership has become a major contributor to the garden. "Rather than sponsor a single event, we are a part of the garden and its mission to provide a full garden experience for all ages," Smith said. The dealership displays a new vehicle at all Great Garden Escapes, a concert series that runs every Thursday from late spring to early fall. "We had a new Subaru Forester with eyelashes and spots at the garden for the bug day event, and we will have cars at all other events throughout the year," Smith said. General Manager Ty Leuthold said the dealership provides tickets to garden events to staff and others through its Facebook page. "We understand the importance of taking care of our community," Leuthold said. Smith admits there is one outdoor plot at the dealership that's not ecologically correct: the vegetable garden near the service area. Water-thirsty tomatoes thrive here, and customers ask for them when they bring their cars in. It's a tradition, he says. Saving natural resources is not limited to landscaping. Solar panels on the south side of the showroom gather power for its charging desks built from used pallets from fixed operations. The bar-height desk area can be used by waiting customers to charge their electronic devices. And last spring, to commemorate founder Larry H. Miller's birthday, staff members spent part of a day at the Boise Bicycle Project refurbishing bikes or, in many cases, building them from used parts, promoting pollution-free transportation while enjoying a chance to learn new skills -- and get greasy.